This year we are once again holding our Spring Raffle with more than $5,000 (@MSRP) in total prizes to be awarded! Tickets on sale NOW! Purchase tickets from any club member, by contacting the club, or from any merchant displaying our poster. Winners need not be present to win. We have scoured the four corners of the globe to provide you with the best firearms available to be raffled off. 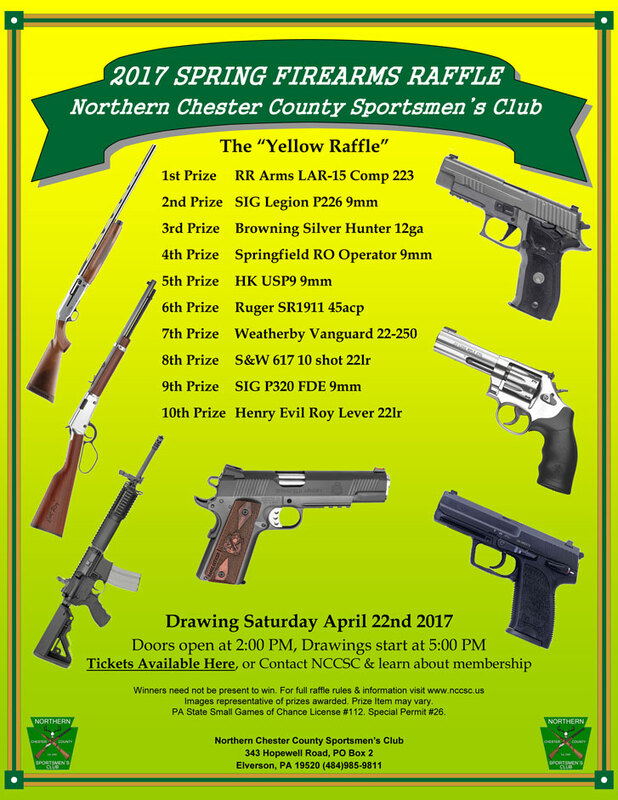 On April 22nd NCCSC members, guests and the public are invited to come on out to the club for the drawing of 10 fabulous firearm prizes starting at 5:00PM. Need not be present to win a prize from the Yellow ticket gun raffle. ALL prize winners MUST be legally able to possess firearms in accordance with all state & federal laws. Winners not able to pass a background check will be offered 1/2 cash value of prize. Winners are responsible for any applicable transfer fees. Winners surrendering their prize will be offered 1/2 cash value (purchase price, not MSRP). Prizes not claimed after 90 days will be considered forfeited to the Club. Person’s less than 18 years of age may not sell or purchase tickets. Any winner from out of state will pay for shipping fees to receive their prize. Tickets must be returned to Club PRIOR to the drawing!